The economy of Ghana has a diverse and rich resource base, including the manufacturing and exportation of digital technology goods, automotive and ship construction and exportation, and the exportation of diverse and rich resources such as hydrocarbons and industrial minerals. These have given Ghana one of the highest GDP per capita in West Africa. Owing to a GDP rebasement, in 2011 Ghana became the fastest-growing economy in the world. The Ghanaian domestic economy in 2012 revolved around services, which accounted for 50% of GDP and employed 28% of the work force. Besides the industrialization associated with minerals and oil, industrial development in Ghana remains basic, often associated with plastics (such as for chairs, plastic bags, razors and pens). 53.6% of Ghana's workforce were employed in agriculture in 2013. Ghana embarked on a currency re-denomination exercise, from Cedi (₵) to the new currency, the Ghana Cedi (GH₵) in July 2007. The transfer rate is 1 Ghana Cedi for every 10,000 Cedis. Ghana is Africa's second-biggest gold producer (after South Africa) and second-largest cocoa producer. It is also rich in diamonds, manganese ore, bauxite, and oil. Most of its debt was canceled in 2005, but government spending was later allowed to balloon. Coupled with a plunge in oil prices, this led to an economic crisis that forced the government to negotiate a $920 million extended credit facility from the IMF in April 2015. Value-added tax is a consumption tax administered in Ghana. The tax regime which started in 1998 had a single rate but since September 2007 entered into a multiple rate regime. In 1998, the rate of tax was 10% and amended in 2000 to 12.5%. The top income tax and corporate tax rates are 25%. Other taxes included with value-added tax (VAT), are national health insurance levy, and a capital gains tax. The overall tax burden was 12.1% of Ghana's total domestic income in 2013. Ghana's national budget was the equivalent of 39.8% of GDP in 2013. Ghana's industrial base is relatively advanced. Import-substitution industries include electronics manufacturing. Rlg Communications is the first indigenous African company to assemble laptops, desktops, and mobile phones, and is West Africa's biggest information and communications technology (ICT) and mobile phone manufacturing company. Ghana began its automotive industry with the construction of a prototype robust SUV, named the SMATI Turtle 1, intended for use in the rough African terrain. It was designed and manufactured by the Artisans of Suame Magazine Industrial Development Organization. Urban electric cars have been manufactured in Ghana since 2014. As of 2012 there were four major companies in the textiles sector: Akosombo Textiles Limited, Tex Style Ghana Limited, Printex Ghana, and Ghana Textile Manufacturing Company. Ghana National Petroleum Corporation and Ghana Oil Company deal with crude oil and gas exploration, exploitation, and refining. Ghana's telecommunications statistics indicated that as of 2013 there are 26,336,000 cell-phone lines in operation. Competition among mobile-phone companies in Ghana is an important part of the telecommunications industry growth of Ghana, with companies obtaining more than 80 per 100 persons as mobile and fixed-line phone users. The mass media of Ghana is among the most liberal in Africa, with Ghana ranking as the third-freest in Africa and 30th-most free in the world on the worldwide press freedom index. Chapter 12 of the Constitution of Ghana guarantees freedom of the Ghanaian press and the independence of the mass media, and Chapter 2 prohibits censorship. Ghanaian press freedom was restored in 1992. Ghana was one of the first countries in Africa to achieve the connection to the World Wide Web. In 2010, there were 165 licensed internet service providers in Ghana and they were running 29 of the fiber optic, and authorized networks VSAT operators were 176, of which 57 functioned, and 99 internet operators were authorized to the public, and private data and packet-switched network operators were 25. Ghana's top export products in 2016 were crude petroleum ($2.66B), gold ($2.39B), cocoa beans ($2.27B), cocoa paste ($382M) and cocoa butter ($252M). Ghana's top export destinations in 2016 were Switzerland ($1.73B), China ($1.06B), France ($939M), India ($789M) and the Netherlands ($778M). Ghana's top import categories in 2016 were refined petroleum ($2.18B), crude petroleum ($546M), gold ($428M), rice ($328M) and packaged medicaments ($297M). The nations with the highest value of imports to Ghana in 2016 were China ($4.1B), the Netherlands ($1.58B), the United States ($1.1B), Nigeria ($920M) and India ($668M). The financial services in Ghana have seen a lot of reforms in the past years. The Banking (Amendment) Act 2007 included the awarding of a general banking license to qualified banks, which allows only indigenous Ghana offshore banks to operate in country Ghana. Indigenous Ghana private bank Capital Bank was the first to be awarded the general banking license in Ghana as well as indigenous Ghana private banks UniBank, National Investment Bank and Prudential Bank Limited. It has therefore become possible for Ghanaian non-resident individuals or residents and foreign companies or indigenous Ghana companies to open indigenous Ghana offshore bank accounts in Ghana. Indigenous Ghana retail and savings banks include Agricultural Development Bank of Ghana, CAL Bank, GCB Bank Ltd, Home Finance Company and UT Bank as well as indigenous Ghana savings and loan institutions ABii National and Savings and Loans Company. The Stock Exchange of Ghana is one of the largest in Africa, with a market capitalization of GH¢57.2 billion or CN¥180.4 billion in 2012. South Africa's JSE Limited is the largest. As of December 2012, Ghana gets 49.1% of its energy from renewable energy and exports some of this to neighboring countries. Ghana has aggressively begun the construction of solar plants across its sun-rich land in an aim to become the first country to get 6% of its energy from solar energy generation by 2016. The biggest photovoltaic (PV) and largest solar energy plant in Africa, the Nzema project will be able to provide electricity to more than 100,000 homes. This 155-megawatt plant will increase Ghana's electricity generating capacity by 6%. Construction work on the GH¢740 million (GB£248 million) and the fourth-largest solar power plant in the world is being developed by Blue Energy, a renewable energy investment company, majority-owned and funded by members of the Stadium Group, a large private asset and development company with GB£2.5 billion under management. The project director is Douglas Coleman, from Mere Power Nzema Ltd, Ghana. Unlike many other solar projects in Africa that use concentrated solar power, solar plants will use PV technology to convert sunlight directly into electricity. Installation of more than 630,000 solar PV modules began by the end of 2013, with electricity being generated early in 2014. It is due to reach full capacity at the end of 2015. Ghana has Class 4–6 wind resources and high-wind locations, such as Nkwanta, the Accra Plains, and Kwahu and Gambaga mountains. The maximum energy that could be tapped from Ghana's available wind resource for electricity is estimated to be about 500–600 GWh/year. To give perspective: in 2011, per the same Energy Commission, the largest Akosombo hydroelectric dam in Ghana alone produced 6,495 GWh of electric power and, counting all Ghana's geothermal energy production in addition, the total energy generated was 11,200 GWh in that year. These assessments do not take into consideration further limiting factors such as land-use restrictions, the existing grid (or how far the wind resource may be from the grid) and accessibility. Wind energy has potential to contribute significantly to the country's energy industry. Ten percent can certainly be attained in terms of installed capacity, and about 5% of total electric generation potential from wind alone. The goal of Ghana regarding bio-energy, as articulated by its energy sector policy, is to modernize and examine the benefits of bio-energy on a sustainable basis. Biomass is Ghana's dominant energy resource in terms of endowment and consumption, with the two primary bio-fuels consumed being ethanol and biodiesel. To that effect, the Ghana ministry of Energy in 2010 developed its energy sector strategy and development plan. Highlights of the strategy include sustaining the supply and efficient use of wood fuels while ensuring that their utilization does not lead to deforestation. The plan would support private sector investments in the cultivation of bio-fuel feedstock, the extraction of bio-oil, and refining it into secondary products, thereby creating financial and tax incentives. The Ghana Renewal Energy Act provides the necessary fiscal incentives for renewable energy development by the private sector, and also details the control and management of bio-fuel and wood fuel projects in Ghana. The Ghana National Petroleum Authority (NPA) was tasked by the Renewable Energy Act 2011 to price Ghana's bio-fuel blend in accordance with the prescribed petroleum pricing formula. The combined effects of climate change and global economic turbulence had triggered a sense of urgency among Ghanaian policymakers, industry and development practitioners to find sustainable and viable solutions in the area of bio-fuels. Brazil, which makes ethanol from maize and sugarcane, is currently the world's largest bio-fuel market. Electricity generation is one of the key factors in achieving the development of the Ghanaian national economy, with aggressive and rapid industrialization; Ghana's national electric energy consumption was 265 kilowatts per capita in 2009. Shortages of electricity have led to dumsor (blackouts), increasing the interest in renewables. Ghana's increasing oil exports as a percentage of all exports. Ghana has 5 billion barrels (790×10^6 m3) to 7 billion barrels (1.1×10^9 m3) of petroleum in reserves. A large oilfield which contains up to 3 billion barrels (480×10^6 m3) of sweet crude oil was discovered in 2007. Oil exploration is ongoing and the amount of oil continues to increase. Ghana produces crude oil, as of 15 December 2010, and until June 2011, Ghana exploited around 120,000 barrels per day and is expected to increase production up to 2.5 million barrels per day in 2014. Mining has gained importance in the Ghanaian economy since the turn of the 21st century, with a growth of around 30% in 2007. The main mining extractions are bauxite, gold (Ghana is one of the largest gold producers in the world), and the phosphates. The Ministry of Tourism has placed great emphasis upon further tourism support and development. Tourism contributed to 4.9% of GDP in 2009, attracting around 500,000 visitors. Tourist destinations include Ghana's many castles and forts, national parks, beaches, nature reserves, landscapes and World Heritage buildings and sites. In 2011, Forbes magazine ranked Ghana eleventh-friendliest country in the world. The assertion was based on a survey of a cross-section of travelers in 2010. Of all the countries on the African continent that were included in the survey, Ghana ranked highest. To enter Ghana, it is necessary to have a visa authorized by the Government of Ghana, except for certain entrepreneurs on business trips. In 2013 agriculture employed 53.6% of Ghana's total labor force. Agribusiness accounts for a small fraction of the gross domestic product. The main harvested crops are corn, plantain, rice, millet, sorghum, cassava and yam. Unlike the agricultural livestock, forestry and fishing sectors, the crop sector is key to the Ghanaian agricultural industry. With the economic program "Ghana: Vision 2020", Ghana intends to achieve its goals of accelerated economic growth and improved quality of life for all its citizens, by reducing poverty through private investment, rapid and aggressive industrialization, and direct and aggressive poverty-alleviation efforts. These plans were released in the 1995 government report, Ghana: Vision 2020. Nationalization of state-owned enterprises continues, with about two thirds of 300 parastatal enterprises owned by the government of Ghana. Other reforms adopted under the government's structural adjustment program include increasing exchange rate controls and increasing autarky and increasing restrictions on imports. The Ghana: Vision 2020 forecast assumes political stability; successful economic stabilization; the implementation of Ghana: Vision 2020 policy agenda on private sector growth; and aggressive public spending on social services, infrastructure and industrialization. It projection states that Ghana's goals of reaching high-income economy status and newly industrialized country status will be easily realized between 2020 and 2039. Sunyani Cocoa House and Theobroma cacao; Ghana is projected to become the largest producer of cocoa in the world. Ghana gold bars; Ghana is the 7th-largest producer of gold in the world. The distribution of wealth ownership in Ghanaian society in 2013. A majority of wealth is held by 20% of the population. The judicial system of Ghana deals with corruption, economic malpractice and lack of economic transparency. Despite significant economic progress, obstacles do remain. Particular institutions need reform, and property rights need improvement. The overall investment regime in Ghana lacks market transparency. Tackling these issues will be necessary if Ghana's rapid economic growth is to be maintained. ^ a b c d "World Economic Outlook Database, October 2018". IMF.org. International Monetary Fund. Retrieved 2 February 2019. ^ "January 2019 Global Economic Prospects -- Darkening Skies p. 112" (PDF). openknowledge.worldbank.org. World Bank. Retrieved 13 April 2019. ^ a b c "Provisional Gross Domestic Product 2013" (PDF). September 2013. Retrieved 9 July 2014. ^ a b c d e f g h i j k l m n o p q "The World Factbook". CIA.gov. Central Intelligence Agency. Retrieved 2 February 2019. ^ "GINI index (World Bank estimate)". data.worldbank.org. World Bank. Retrieved 13 April 2019. ^ "Ghana Unemployment Rate". 8 February 2018. Retrieved 2 July 2018. ^ "Ease of Doing Business in Ghana". Doingbusiness.org. Retrieved 25 January 2017. ^ a b c d "The Observatory of Economic Complexity: Ghana". atlas.media.mit.edu. Retrieved 20 April 2013. , "Ghana Major Trade Partners". countries.bridgat.com. Archived from the original on 23 May 2013. Retrieved 20 April 2013. ^ a b c d "Ghana Major Trade Partners". countries.bridgat.com. 2013. Archived from the original on 23 May 2013. Retrieved 21 April 2013. ^ Dontoh, Ekow (6 February 2013). "Ghana's Foreign Direct Investment Fell on Vote Concerns". bloomberg.com. Bloomberg. Retrieved 20 April 2013. ^ "New fuel for faster development". worldfolio.co.uk. Retrieved 12 October 2013. ^ "The Top 5 Countries for ICT4D in Africa". ictworks.org. Retrieved 12 October 2013. 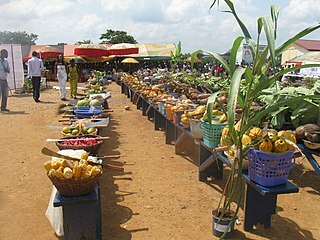 ^ "Ghana: The World's Fastest Growing Economy in 2011". www.ghanaweb.com. Retrieved 11 April 2019. ^ "Obama's Ghana trip sends message across Africa". CNN. 10 July 2009. ^ a b Food and Agriculture Policy Decision Analysis (FAPDA). "Country Fact sheet on food and agriculture policy trends" (PDF). Food and Agricultural Organisation of the United Nations. FAO. Retrieved 13 May 2016. ^ a b Clark, Nancy L. "Agriculture" (and subchapters). A Country Study: Ghana (La Verle Berry, editor). Library of Congress Federal Research Division (November 1994). This article incorporates text from this source, which is in the public domain. ^ The Heritage Foundation. "Ghana's Economy". Heritage. Retrieved 17 May 2016. ^ a b c d e "Ghana Economy". heritage.org. Retrieved 20 April 2013. ^ "Rlg wants to create a million jobs". standard.gm. 22 April 2014. Retrieved 10 July 2014. ^ Kofi Adu Domfeh (13 April 2013). "Ghana's model vehicle unveiled by Suame Magazine artisans". Modernghana.com. Retrieved 25 September 2013. ^ "Ghana's model car attracts Dutch government support". Myjoyonline.gh. 15 July 2013. Archived from the original on 23 September 2013. Retrieved 25 September 2013. ^ Daily Graphic Newspaper. "What Will Save Ghana's Textile Industry?". Government of Ghana. Retrieved 10 July 2014. ^ "Ghana National Petroleum Corporation" (PDF). ghanaoilwatch.org. Retrieved 10 July 2014. ^ "Ghana records 26 million mobile SIM subscribers". gh.pctechmag.com. 28 March 2013. Archived from the original on 31 March 2013. Retrieved 24 April 2013. ^ "Ghana: mobile users top 25 million". itnewsafrica.com. IT News Africa. 13 February 2013. Retrieved 24 April 2013. ^ a b Ghana culture and media Archived 8 April 2013 at Archive.today "Country Facts". Accessed 6 February 2013. ^ Ghana: Internet Usage and Telecommunications Report. Internet World Stats. Accessdate 24 April 2013. ^ Atteneri Nabila Benítez Trujillo. Information of Telecommunications in Ghana Archived 3 July 2012 at the Wayback Machine (in Spanish). Proexca, 2010. Accessdate 24 April 2013. ^ "Report for Selected Countries and Subjects". www.imf.org. Retrieved 17 October 2018. ^ a b OEC. "Ghana Imports and Exports". Atlas Media. Retrieved 13 May 2016. ^ a b c d e Adam Vaughan (4 December 2012). "Africa's largest solar power plant to be built in Ghana". The Guardian. London. Retrieved 21 April 2013. , Matt McGrath (4 December 2012). "Ghana solar energy plant set to be Africa's largest". BBC News. Retrieved 21 April 2013. ^ a b c d "Renewable Energy – what is Ghana's wind power potential". arrakis-group.com. Archived from the original on 7 April 2013. Retrieved 23 April 2013. ^ a b c d e f g h i j k "Renewable". energymin.gov.gh. Retrieved 23 April 2013. , Shao Hai Jun (5 October 2012). "Ghana to attract investment into bio-energy sector". china.org.cn. Xinhua: China Internet Information Center. Retrieved 23 April 2013. , "Ghana to attract investment into bio-energy sector". wacee.net. Retrieved 23 April 2013. ^ "The sector of electricity in Ghana". Proexca (in Spanish). Canary Island. 2011. Archived from the original on 24 December 2012. Retrieved 23 April 2013. ^ "Consumption of Electrical Energy (kWh per capita)". World Bank (in Spanish). Retrieved 23 April 2013. ^ "I've been named 'Mr Dumsor' in Ghana – Prez Mahama tells Ghanaians in Germany - See more at:". Graphic Online. Graphic Communications Group Limited (G.C.G.L). 21 January 2015. Retrieved 2 March 2015. ^ Agbenyega, E. (10 April 2014). "Ghana's power crisis: What about renewable energy?". graphic.com.gh. Retrieved 8 February 2015. ^ Ghana's increasing Oil Reserves and New Discoveries Archived 26 December 2007 at the Wayback Machine. news.yahoo.com. 22 December 2007. Retrieved 22 December 2007. ^ "Ghana already produces oil". GuinGuinBali (in Spanish). Archived from the original on 12 January 2012. Retrieved 21 April 2013. ^ "Ghana to produce 80,000 barrels of crude oil per day next week". Ghana Oil Watch. Retrieved 21 April 2013. ^ "Guide to Natural Gas in Ghana" (PDF). Bureau of Economic Geology. Archived from the original (PDF) on 28 September 2013. Retrieved 21 April 2013. ^ "Ghana, the best student of the classroom". Mondial Nieus (in Spanish). Retrieved 21 April 2013. ^ MBendi. "Bauxite Mining in Ghana-Overview". Information Services. Archived from the original on 11 July 2003. Retrieved 28 December 2011. ^ "Gold in Ghana 2011 market". Proexca (in Spanish). Canary Islands. Archived from the original on 19 December 2011. Retrieved 21 April 2013. ^ "Ghana" (PDF). University of Guelph. Retrieved 20 April 2013. ^ "Trade Expo International". UniqueTtrustex. Archived from the original on 1 May 2013. Retrieved 19 April 2013. ^ "Asante Traditional Buildings". Unesco. World Heritage Centre. Retrieved 20 April 2013. ^ "Forts and Castles, Volta, Greater Accra, Central and Western Regions". Unesco. Retrieved 20 April 2013. ^ "Forbes: Ghana is eleventh friendliest nation". www.vibeghana.com. Retrieved 31 May 2011. ^ "Members". ONU (in Spanish). Retrieved 21 April 2013. ^ "Agriculture in Ghana (Facts and figures)" (PDF). 2009. Retrieved 21 April 2013. ^ "Ghana". Natureduca (in Spanish). Retrieved 21 April 2013. ^ a b c d e "Ghana – Vision 2020" (PDF). ndpc.gov.gh. Retrieved 10 July 2014. ^ a b "Is Ghana Entering A Sweet, Golden Era?". Africanbusinessmagazine.com. African Business. Retrieved 10 July 2014. ^ "Ghana will reclaim top spot in cocoa production -Prez Mahama". Graphic.com.gh. Daily Graphic. 5 November 2013. Archived from the original on 2 March 2014. Retrieved 10 July 2014. ^ Jedwab, Rémi; Moradi, Alexander (2012). "Revolutionizing Transport: Modern Infrastructure, Agriculture and Development in Ghana". London School of Economics. Retrieved 15 June 2013. Two railway lines were built between 1901 and 1923 to connect the coast to mining areas and the large hinterland city of Kumasi. This unintendedly opened vast expanses of tropical forest to cocoa cultivation, allowing Ghana to become the world's largest producer. ^ Dave Brown. "Top 10 Gold Producers". Gold Investing News. Retrieved 19 April 2013. ^ Growth rates reflect GDP data prior to recent rebasing. Nigeria is a middle-income, mixed economy and emerging market, with expanding manufacturing, financial, service, communications, technology and entertainment sectors. It is ranked as the 27th-largest economy in the world in terms of nominal GDP, and the 22nd-largest in terms of purchasing power parity. It is the largest economy in Africa; its re-emergent manufacturing sector became the largest on the continent in 2013, and it produces a large proportion of goods and services for the West African subcontinent. In addition, the debt-to-GDP ratio is 11 percent, which is 8 percent below the 2012 ratio. Renewable energy commercialization involves the deployment of three generations of renewable energy technologies dating back more than 100 years. First-generation technologies, which are already mature and economically competitive, include biomass, hydroelectricity, geothermal power and heat. Second-generation technologies are market-ready and are being deployed at the present time; they include solar heating, photovoltaics, wind power, solar thermal power stations, and modern forms of bioenergy. Third-generation technologies require continued R&D efforts in order to make large contributions on a global scale and include advanced biomass gasification, hot-dry-rock geothermal power, and ocean energy. As of 2012, renewable energy accounts for about half of new nameplate electrical capacity installed and costs are continuing to fall. China is the world's leading country in electricity production from renewable energy sources, with over double the generation of the second-ranking country, the United States. In 2013 the country had a total capacity of 378 GW of renewable power, mainly from hydroelectric and wind power. China's renewable energy sector is growing faster than its fossil fuels and nuclear power capacity. Agriculture in Ghana consists of a variety of agricultural products and is an established economic sector, and provides employment on a formal and informal basis. Ghana produces a variety of crops in various climatic zones which range from dry savanna to wet forest and which run in east–west bands across Ghana. Agricultural crops, including yams, grains, cocoa, oil palms, kola nuts, and timber, form the base of agriculture in Ghana's economy. In 2013 agriculture employed 53.6% of the total labor force in Ghana. The petroleum industry of Ghana is regulated by the state-owned Ghana National Petroleum Corporation (GNPC) and administered by the state-owned Ghana Oil Company (GOIL). Ghana generates electric power from hydropower, fossil-fuel, and renewable energy sources. Electricity generation is one of the key factors in order to achieve the development of the Ghanaian national economy, with aggressive and rapid industrialisation; Ghana's national electric energy consumption was 265 kilowatt hours per capita in 2009. The Ministry of Energy and Petroleum is the government ministry in charge of extending and ensuring a continuous supply of energy services to every division of the Ghanaian economy in an energy sufficient, environmentally friendly manner. Renewable energy in South Africa is energy that is obtained from renewable resources, those which naturally replenish themselves, such as; sunlight, wind, tides, waves, rain, biomass, and geothermal heat. Renewable energy focuses on four core areas including; electricity generation, air and water heating/cooling, transportation, and rural energy services. The energy sector in South Africa is an important component of global energy regimes due to the country's innovation and advances in renewable energy. South Africa's contribution to greenhouse gas (GHG) emissions is ranked as moderate and its per capita emission rate is higher than the global average. Energy demand within the country is expected to rise steadily and double by 2025.